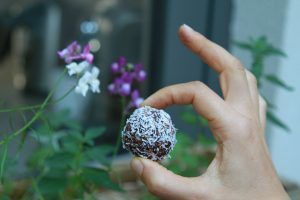 These bliss balls are like little flavour bombs with no refined sugar or hidden nasties. I love cooking with essential oils but it is important to ensure that you purchase food grade cold-pressed oils. 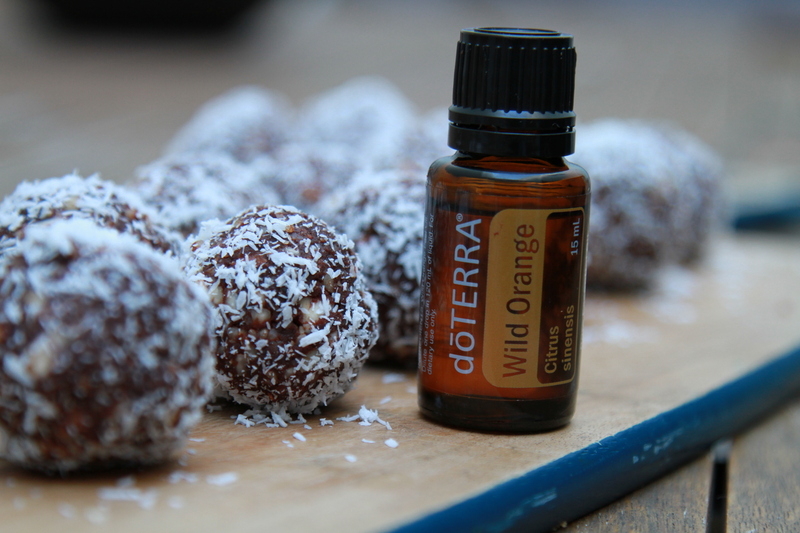 The oil used in this recipe is made from the orange peel, Wild Orange is commonly used for its wonderful citrusy aroma. It is also wonderful as a flavoring! These essential oils are gently distilled from plants that have been harvested for ideal extract composition and efficacy. They are naturally safe, purely effective therapeutic-grade essential oils. Add the almonds and cashews to a food processor and blitz until roughly chopped. Add raw cacao powder and blitz until well combined and nuts are broken into small pieces. Remove dates from water and keep water for later. Add dates to food processor and blitz until well blended. Slowly add water (that the dates were soaking in) and wild orange oil until all ingredients are well combined. Roll into small balls and roll in a small bowl of desiccated coconut.